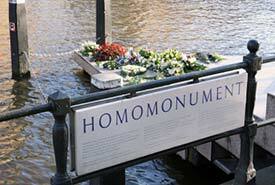 ABOVE: The Homomonument in the Keizersgracht. These pages are from Patroc Travel Gay Guide Europe, which has local gay guides for more than two dozen European cities. Amsterdam's oldest gay hotel (formerly the Hotel Unique) opened in 1948. The one-star property occupies two 18th Century buildings in central Amsterdam, a block off the Prinsengracht. Every room is different at the ITC, a two-star gay hotel in a renovated canal house on the Prinsengracht. The hotel has its own bar and is near Amsterdam's gay nightlife districts. The Amsterdam branch of the International Gay and Lesbian Centre and Archive Foundation is both a resource for scholars and a reference library for anyone with an interest in GLB culture. Four dozen clubs were listed here the last time we counted. The descriptions include maps, and you can read users' reviews or add your own.